Any oil change I have done during this time period has been with a filter from outside that time frame. I hope this bulletin doesn't cause a major out of stock issue like some of the others. My stock is getting low and I will need to order some. Does anybody know how many filters are affected? It looks like most of the 2017 production run. I recently bought 4 new filters and installed one on my last oil change. This will be a PITA if they are all bad, since according to the SB I won't be able to fly until I get a known good replacement filter. Could be quite an annoyance for a lot of owners. It seems like it's okay to burp the engine, spin off a bad filter, put a good one on, and hand turn the engine a bunch of times. Just like an oil change, without touching the oil. Correct? I just checked my recent oil filter order. The part number for the oil filter is 825-012, however the bulletin says this affects filter number 825-016. What is the difference between the two model numbers, anyone else using 825-012 in their CT? I’m not seeing a 825-016 filter. Hoping I’m using the right filter now. The ones I ordered from CPS are also apparently -012 parts. I guess I'm curious about the difference too! Sometimes the same part can have multiple numbers for different applications, maybe that's what's happening. Dean Vogal from Lockwood said this morning that 010 and 012 filters are not included in this SB. But what is the difference between them and the -016? Different filter Mfg. No check valve any more. Roger, what was the reason for having the check valve on the older filters? Or, was this "check valve" really a "pressure release" valve which allowed bypass of the element should the filter become plugged? The bypass valve exists in all oil filters. I don't think you can get certification or approvals without it. 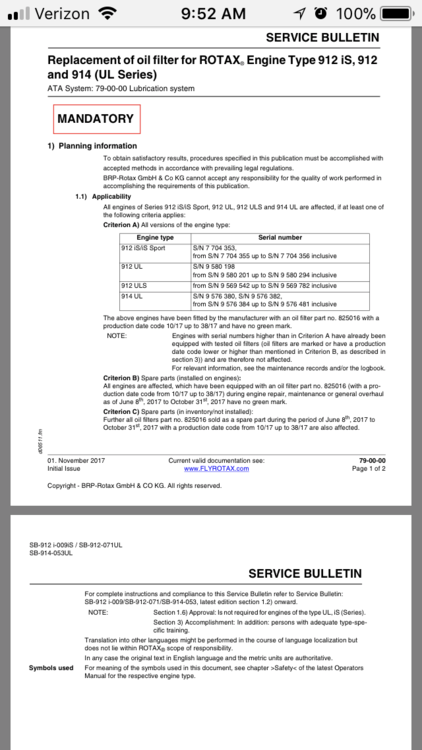 Do you think Flight Design requires the check valve for their "cert and approval" or are you referring to a filter requirement spec for aircraft engines in general? I know that the "old" filters could be filled up with a few ounces of oil to "prime" them prior to installing on the engine. I assume that these did not have check valves. Then, there were newer filters these last few years which did not accept the "prime" oil. On these filters, I assume there were no check valves. Now, will the newest filters again accept oil due to these no longer having check valves? There's no need to prefill them before installing them. 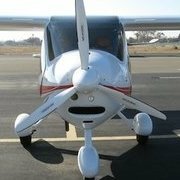 You do that when you turn the prop after the oil change but before you start. ALL oil filters have a bypass. If there's any that do not, it's because it goes on an engine or component that has the bypass built in. Consider what would happen if the oil filter clogged... it would collapse and/or starve the engine without a bypass! Dirty oil is better than no oil at all. Funny side story: on Allison engines installed on some helicopters, there's a bypass warning on the filters. If they go into bypass, you have to tear the engine down. Very, VERY expensive. Someone got clever, and made a mod to install a second oil filter in series. That way, as long as both filters do not go into bypass, you do not have to do a teardown.